Marion Reynold Fretwell was born Nov 25, 1918, in Parma, Idaho, to William Lafayette Fretwell and Fannie Sparks (Ramsey) Fretwell. He passed on March 23, 2015, in his sleep, at age 96 yrs., 3 months, and 26 days. 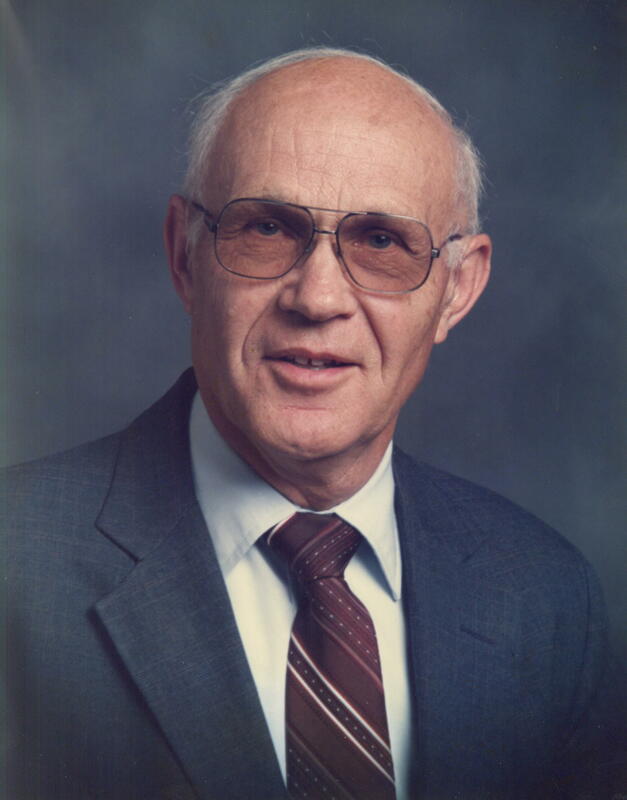 He was educated in the Roswell, Idaho Rural School, and graduated from high school in 1937. He attended Northwest Bible Training Home in Caldwell, Idaho, where he met his future wife, Pearl Snider. They were married at Tieton, Washington, July 20, 1939. They attended the Big Downtown Missionary Training Home in Oakland, California, in 1940. He was ordained to the Ministry in 1943. Together, they pastored the Tieton Pentecostal Church after the Pearl Harbor attack. Later, they were pastors of various churches in Idaho and Oregon. They moved to Yakima in 1949, their final pastorate of 23 years, at Emmanuel Assembly. For many years thereafter he published ministerial articles monthly by mail and by Internet, and authored one book. He was a member of the International Ministerial Association. Marion also worked for many years at Standard Paint, and was an expert repairman for high pressure airless paint sprayers, and bore the nickname "Barney" to distinguish him from other Marions there. He is survived by all four of his children: Louise Wheadon of Las Vegas, Nevada, Marvin Fretwell of Mesa, Arizona, Kathy Fretwell of Columbus, Ohio, and Pete Fretwell of Robbinsville, New Jersey; six grandchildren, 12 great grandchildren, and five great-great grandchildren. As Marion's eldest son, I think I knew him as well as anyone, and I can truthfully say that Dad was a man after God's own heart -- much in the same way as King David. That is, he wasn't perfect, he made as many mistakes as the rest of us, but oh how quickly he would correct any mistake he made. He was never afraid to profoundly apologize if he felt he had harmed or offended someone. He was a constant seeker of truth. He didn't have all truth, but he never ended his quest for more. Add to this his love of God, and he was a man to love and respect. How blessed I have been to have him as a part of my life for the almost 72 years of my lifespan. I already miss him. If you would like to know more about this remarkable man, I have written several pages of his "history" which helps explain the man he was. You can read this mini-history here. Stephen Colbert, of Comedy Central's "The Colbert Report" last October made clear that his mantra would henceforth be "truthiness," -- a devotion to information that he wishes were true even if it is not. "I'm not a fan of facts," he explained (tongue in cheek). "You see, facts can change, but my opinion will never change, no matter what the facts are." Obviously Colbert saw a disturbing trend, and provided his answer as to why it is occurring. Because people wish it were true, they make it true in their own minds. Jesus spoke of those who had a love for truth. He said these people, who had a love for truth, were the discoverers of more truth. And he spoke of those who had no love for the truth. These people, he said, ended up believing a lie. Simple statements, but incredible truths. The outcomes are different. However you read and understand these words of Jesus, it is clear that he said those who seek truth gain more truth, and those who ignore truth that is inconvenient to their opinions/desires end up in error. Daniel Goleman has written a seminal book called "Emotional Intelligence: Why It Can Matter More Than IQ". Most reviewers have absolutely missed the point of his book. They argue against the evidence -- indeed the intuitive knowledge -- that emotional intelligence exists, or that emotional intelligence is important to a person's happiness and success. We knew that, even if we didn't give it the exquisite name that Goleman has. What they all ignore -- you cannot miss it if you read the book -- is that he gives us a blueprint for solving much of what ails our public school system -- to say nothing of society as a whole. Read my comments about Goleman's book <here>. Every so often I read an article that I think puts something in perspective better than any of the other articles I have read on the topic. I just read a wonderfully lucid article by George Friedman of Stratfor that meets this criterion. I have permission to reprint it here. Think about whether the social agreement is working in the United States? Think about whether it is working in Europe? Is the International Monetary Fund doing the right thing in bailing Greece out -- using funds from the U.S. and Great Britain as a major part of the bailout? What does the social contract say about the Supreme Court's recent decision that gives corporations the same rights of free speech as real persons? Read George Friedman's thoughtful analysis <here>. A lot of economic theory has been accepted like religion, "by faith," instead of by withstanding critical examination. I think parts of economic theory are like parts of psychological theory: severely under-evaluated. Don't get me wrong, both psychology and economics have many serious scholars who are very rigorous. But both fields seem to attract greater-than-normal numbers of ideologues in scientist's trappings; probably because it is harder to disprove their whacky theories in these two disciplines than it is in the so-called hard sciences. One of the widely acclaimed but spurious economic theories is that corporate takeovers are good for our economy because they weed out the inefficient and promote the efficient. Well, let's take a look at how it usually works, and you decide if the theory holds up to scrutiny or not. "Equal justice for all" is a foundational aspect of good Christian doctrine, rule of law, and democracy. It is rapidly declining in America, and our churches are silent about it. They, more than any other sector, should be the champions of justice. But they are derelict in their duty. Copyright © 2010-2015 by Marvin O. Fretwell; all rights reserved.